Pssssssst…I did a podcast related to this called “Harry Potter and Heart Disease” that you can check out here. Long before I knew that the Hogwarts Running Club existed, Harry Potter inspired be to start running and to lose weight. No one taught how to lose 150 pounds. I had to learn that on my own, but Hogwarts and wizarding was a major player in getting me there. Most of my life, I was the token fat guy in my group of friends. Always. For most of my life, I was chunky, and I just kept gaining weight, topping out at 310 pounds. I hated exercise. I hated sports, hated sweating, hated pretty much anything that involved expending energy. Fitness and health were so not my things. I was a geek, a nerd, the smart kid in class. I spent so much time indoors playing video games and reading that one of my best friends, who is an albino joked that his albinism was contagious because I hated the sun almost as much as he did. So year after year, I kept gaining weight and living an incredibly sedentary lifestyle. I might have been unhealthy, but I was happy. I never looked in the mirror and said, “I want to get better” because I didn’t think there was anything to get better from. It never even really bothered me to weigh 310. I was funny and friendly, girls actually paid attention to me — romantically, too! So why bother doing stuff I hated and that would only make me miserable? Everyone told me how cute I was! Just look at this big ole goober. Well, let me rephrase that. Something wouldn’t click. My wife and I went to the Wizarding World of Harry Potter during the summer of 2010, and we stood in line to ride the Dragon Challenge roller coaster. I sat in the fat-guy seat as always, and the attendant couldn’t even click the safety harness down over my gut because I was so big. The poor guy even jumped into the air to put all his weight onto it. He was only able to get it to fasten into the first lock because I was so big. That harness was supposed to click three times. Not once. They sent the coaster on, and I thought I was going to die. Literally. I thought I was going to be flung out of that roller coaster and be on the Orlando news that night and go viral on YouTube as the fat wizard who couldn’t fly after all. Later that day, I tried out the Harry Potter and the Forbidden Journey seats, and they were too small for me to even get into. Thankfully, the ride was down for maintenance and saved me from that embarrassment a second time that day. At that moment, as I stood in Hogsmeade Village, I knew my life had to change. My weight was not going to hold me back from living my life. Being 27 years old and newly married, I had my whole life in front of me. And by God, I was going to enjoy it. And when my dad died a couple years later of congestive heart failure after having 12 years of annual-ish heart attacks, it just reinforced that I’d made the right choice in changing my lifestyle. I didn’t want to go through what he did, and I sure as hell didn’t want to put my family through it. Something had to go. And that something was, in the end, 155 pounds. So I changed my life. I’m still changing my life. And you can change yours. Well, first of all, I was not able to Avada Kedavra all that extra weight. There’s no magic spell that can change your life. I had to change my eating habits, and I started to cycle and then figured out how to start running. Fitness and health became an integral part of my life. It became a priority in my life over nearly everything else. It had to because of how disconnected I was from self-care and wellness initially. Keep in mind, though, that losing weight won’t solve all your problems. Don’t let me even begin to think that. But my weight had been a Dementor that followed me around. It sucked my soul, and I didn’t even know it was happening. (I even had a friend who said my weight followed me around like a little dark stormcloud follows a cartoon character.) I’ve struggled with anxiety and bipolar 2 since then, and those are biochemical and had always been there. Learning how to lose 150 pounds just let me dig deeper into myself and deal with the real, underlying issues that were holding me back. Losing weight won’t solve your problems, but it can change your life. When I finally started understanding how to change my lifestyle and getting into fitness, it was like finally casting expecto patronum after years of just not getting it. My patronus erupted into life, and pushed away that Dementor. My head was finally clear enough to do a complete and much-needed lifestyle overhaul. The important thing to note here is that I didn’t diet — I changed the way I looked at food. I didn’t just work out — I trained for races or to reach a goal. I not only changed the way I thought about things, but I changed the way I lived my life. You’re a Wizard, Harry B.J.! Hogwarts changed my life. Sure, I may have never lived in a cupboard under the stairs, and my parents were loving and supportive and totally not murdered by an evil wizard. But I was changed by Dementors, and when I finally learned how to lose 150 pounds by casting expecto patronum (well, starting to run and care about nutrition, but whatevs), I went on to lead a better life. I am living a better life. It’s hard. I won’t lie to you. I’ve had my share of days and nights that are much like Harry and the gang camping in the woods in Deathly Hallows, but like them, I got through them. Mainly because I had friends around. I couldn’t have done any of this if I hadn’t been surrounded by such a wonderful group of friends. They keep us stable and push us when we think we can’t go any farther. Runners are the most supportive group of people that I have ever seen. No matter if you’re fast or slow, fat or fit, if you lace up and hit the roads or trails, you’re a member of the family. Between hashtags on Twitter like #runchat and #bibchat to social networks like Fitocracy, the internet is kind of like the Room of Requirement. It gives you what you need, as long as you make the effort to go looking for it. These days, you can go to races and be welcomed immediately. There are running groups in almost every town, and you just have to post on Facebook or Instagram about running and someone local will be right there to talk to you about it and help. There just aren’t enough words in the English language to express how wonderful the running community really is. That’s what keeps me pounding the pavement, keeping the weight off. Keeping the Dementors at bay and living the life I would denied myself if I actually had fit on that roller coaster in Orlando. I started the low-glycemic index diet. It taught me how to eat well without all the processed garbage I was used to. I used phentermine for a while, too, before weaning off of it. But the real turning point that made it sustainable when I started running (despite having exercise induced asthma). That was the point at which I really found what I loved and has kept me moving all these years. Sure, I’ve done strength training and cycling and P90X and tons of other stuff (but never CrossFit because…ew). But running clicked — totally unlike that roller coaster harness. To this day, I wear a souvenir Wizarding World t-shirt that I bought for my dad. It reminds me of why I live the life I do, and the Marauder’s Map hangs on my bedroom wall for the same reason. I used to think that I was too special to even need to lose weight. Rarely have I ever been so wrong in my life. 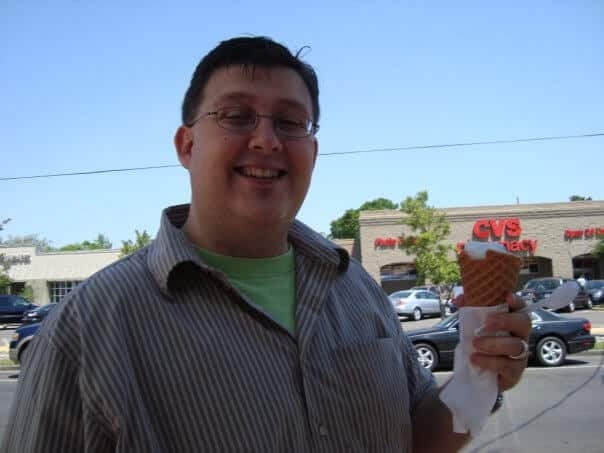 It took me from June of 2010 to August of 2012 to go from 310 pounds to 175, and those final 20 lbs shed over the next year or so as I got better at running and healthful eating. That’s it. It’s pretty simple, but it sure ain’t easy. But you gotta start somewhere. So grab your bag, lace up your tennies, and get ready to hit the gym. Sooo proud of you! Miss stopping by at your office! Great job BJ! Proud of you and that’s awesome motivation for the rest of us. If you get time, tell me bout that diet/exercise plan! Thanks and congrats again. Congrats on launching the new blog! I’m really excited to read more about your story. It’s amazing to me that you’re willing to share something so personal. I think it’s going to make for some fantastic writing. Awesome website, I will be eagerly following along as I, too, am walking this path. It started out easy for me, since when you are heavy, you can still eat a lot and lose weight – you just have to eat less. It gets harder as you get thinner. I lost 63 pounds in a year and then had some personal issues which cause me to lose focus and gain some of that back. Now I am back on track and hope to get back to 63 and beyond. And depending on what you eat, you can still eat almost the same amount for a while. I mean, veggies don’t quite equate to cake, but you can get stupidly full on tasty, healthy stuff. People just tend not to. You’re right. The hard part, though, is the constant adjustment as you get smaller. You can get there, man. You’ve done it once, so you can definitely do it again!